Our goal is to develop novel chemical tools such as imaging probes and therapeutic agents to respond to neurological disorders. The Center for Neuro-Medicine focuses on creating novel chemical compounds for monitoring and regulating brain functions. 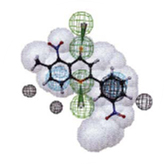 To develop therapeutics and imaging agents for responding to neurologic and psychiatric diseases, we design and synthesize novel molecules based on medicinal chemistry as well as in-silico drug design via chemo-informatics tools. We pursue our goal by evaluating the small molecule library in terms of in vitro assaying, cell-based screening, and in vivo animal studies.